The UPTET 2017 was the sixth edition of the TET Examination held on 15 October 2017 for primary level ( Paper-1, class 1 to 5, 10 am – 12:30 pm ) and upper primary level ( Paper-2, class 6 to 8, 2:30 pm – 5 pm ). According to some reputed sources, approximately 9.76 Lakh candidates has tried their luck in the UPTET 2017 exam to fulfill their dream of getting Uttar Pradesh primary teachers job. Although the results for the past UPTET examinations wasn’t that great, but the trends for passed UPTET candidates are getting upwards with all the UPTET examinations held till date. In the past there was very limited study material available for the UPTET exam preparation, but now a days the UPTET Examination preparation material is available in bulk over the internet and the print media. Adding another chapter to the same process, today we are here with the official / original previous year UPTET 2017 question paper (SET B) for the upper primary level (Paper-2, Class 6 to 8, UPTET UPRI-2017). If you are willing to try your luck about cracking the coming UPTET examination, this official UPTET question paper with the answer keys / sheets will give you the real feel of attempting the UPTET examination. You can use these previous year UPTET question papers as UPTET model test papers or the practice sets. 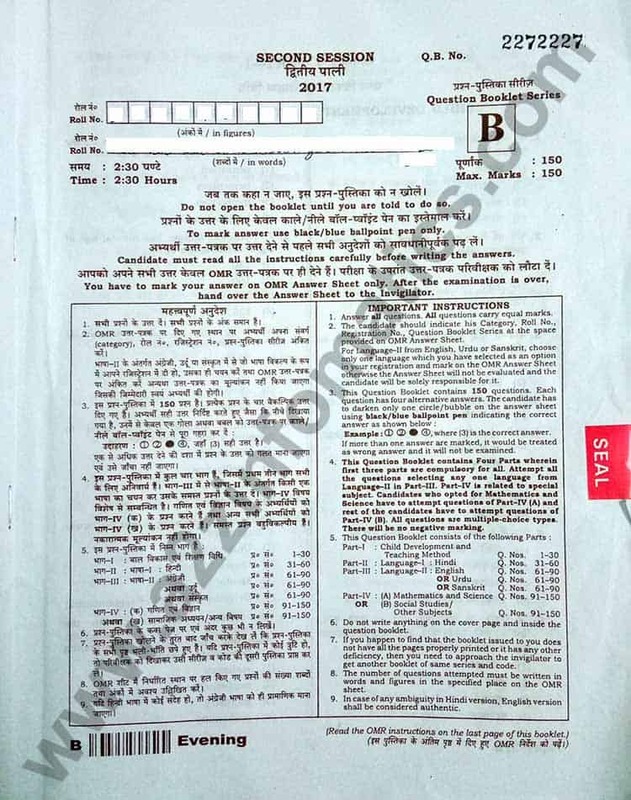 Not only the UPTET, the TET candidates from the other states can include these UPTET previous year question papers to the practice sets for their respective TET examination. Download UPTET 2017 Upper Primary Level (UPRI, Paper–2, class 6-8) Previous Year Solved Question Paper in Hindi / English / PDF Format. Download UPTET 2017 UPRI Question Paper-2. Students preparing for the coming UPTET Examination. Organisation / Institutions associated with the TET exam preparation programme or courses. Students from all over the country, preparing for their respective TET or any other competition exams. General public can use these previous year solved UPTET question papers to increase their knowledgebase. Important Stats / Facts related to UPTET 15 October 2017 Examination. Total candidates applied for UPTET 15 October 2017 Examination: 10,09,347. Total number of rejected Applications by UPBEB: 32,587. Total numkber of Candidates appeared in the 15 Oct 2017 UPTET Exam: 9,76,760. Total number of UPTET 2017 Primary Level (Paper-1, class 1-5) candidates: 3,49,192. Total number of UPTET 2017 Upper Primary Level (Paper-2, class 6-8) candidates: 6,27,568. Official UP TET 2017 Answer Key release date: 18 October 2017 (12 Pm). Official UPTET 2017 Result Date: 30 November 2017 (12 PM). Download Official UPTET 2017 UPRI (Upper Primary Level, class 6 to 8) SET B Solved Question Paper with Answer Keys / Solutions in Hindi / PDF Format. 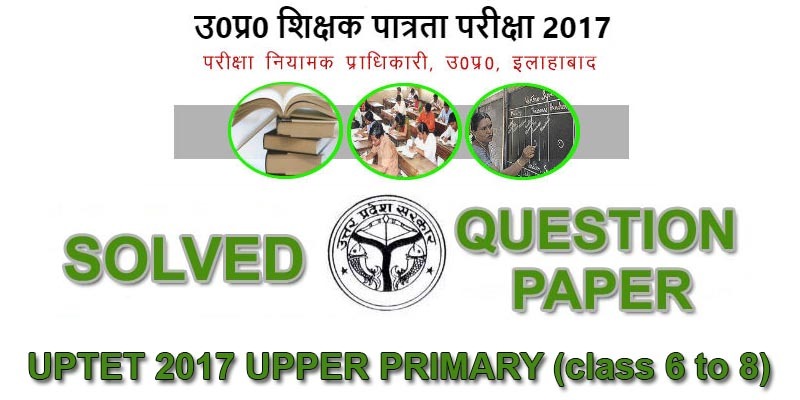 UPTET 15 October 2017 Upper Primary (class 6 to 8) solved Question Paper consist of total 40 pages, the UPTET 2017 official question paper has been seperated into 4 Sections which have been fully discussed under the next heading of this post. Prior to attempt the Uttar Pradesh Teacher Eligibility Test, do read all the important instructions very carefully. Sections of the UPTET 2017 Upper Primary Level (UPRI, class 6 to 8, Paper-2) Question Paper. Part 1 (30 Marks): Child Development and Teaching Method / बाल विकास एवं शिक्षण विधि. Part 2 (30 Marks): Language – 1, Hindi / भाषा – 1, हिन्दी. Part 3 (A) (30 Marks): Language – 2, English / भाषा – 2, अंग्रेजी. Part 3 (B) (30 Marks): Language – Urdu / भाषा – उर्दू. Part 3 (C) (30 Marks): Language – 2, Sanskrit / भाषा – 2, संस्कृत. Part 4 (A) (60 Marks): Science & Mathematics / विज्ञान एवं गणित. Part 4 (B) (60 Marks): Social Studies & Other Subjects / सामाजिक अध्ययन एवं अन्य विषय. Note: Part no 1 and 2 is mandatory to attempt for all the candidates, with a choice to select any 1 sub-part from Part no 3 and 4 from the above sections. For easy understandings, the candidates have to attempt any one language from Part 3 as declated in the UPTET registration form. Part 4 (A) is for SCIENCE stream applicants and the Part 4 (B) is for ART stream UPTET applicants. Download Official UPTET 15-October 2017 Solved Question Paper-1 (Primary Level, class 1 to 5) SET D with Answer Keys / Solutions in Hindi / PDF format. If you are interested to download UPTET Oct 2017 Primary Level (PRI, class 1 to 5) solved question papers, the link below will satify all your needs. Download UPTET 2017 Primary Level (class 1 to 5, Paper-1) in hindi / PDF format. Download Official UPTET 2017 Answer Keys / Solutions for all SETS of PRI (class 1 to 5 Primary Level) & UPRI (class 6 to 8 Upper Primary Level) – Download UPTET 2017 Official Answer Keys. Buy Online – UPTET Preparation Books. Download UPTET 2017 UPRI (Paper-2, Upper Primary Level, class 6-8) Solved Question Paper / Booklet Series B. Important: The UPTET 2017 Official / Original Question Paper (UPRI-2017) is made up of total 40 pages, link to all pages is given at the bottom of this post. You are now at page number 1 of UPTET 2017 Upper Primary Level (UPRI, Paper-2, Class 6 to 8) Fully Solved Question Paper SET-B in Hindi / English. To download UPTET 2017 UPRI Paper-2 in PDF format, visit other pages of this post (links given at bottom). The UPTET 2017 UPRI (Paper-2, Class 6-8) exam was held on 15 October 2017 in the Second Meeting (02:30 Pm – 05:00 Pm). Note: Use Right Click (PC/Laptop) or Long Press (Mobile/Tablet) > Save Image as > Save option to download UPTET 2017 Official / Original Upper Primary Level Question Paper 2 (UPRI, Class 6 to 8).